…it is I, the Lord, the God of Israel, who call you by your name. 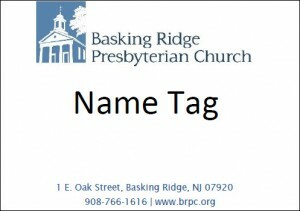 Fill out the form below, and we’ll print you a name tag you can wear at church! You can pick it up in the church house behind the reception desk. Be sure to check out our new magnetic attachment name tags below. Several print styles & color combinations available. A generous church member has agreed to cover the full cost for all who want a name tag! Instructions Please enter your first and last name, as you want them printed on the name tag. Payment A generous donor has volunteered to pay for name tags for all who want them! Thank You!